The Kruger National Park lies in the north-east of South Africa and runs along the border of Mozambique in the east, Zimbabwe in the north, and the southern border is the Crocodile River. The park covers 20,000 square kilometers and is divided in 14 different ecozones, each supporting different wildlife. The park was established in 1898 by the South African President Paul Kruger as a protected area for wildlife and it opened its gates to the general public in 1927 for the first time. 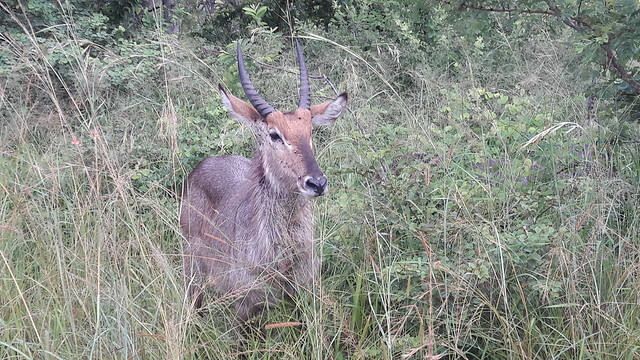 We chose Bubezi Safaris for a guided full day trip in the park and it was a very good choice. You can opt for going in the park on your own, by car, but for a full experience, a guided tour is more than recommended. The guide, has a lot of experience and knows where and how to spot all the animals. Andy, our guide, was just amazing. He offered information about each animal, about how they live, how they feed, what are their characteristics, he took all day to show us the beauties hidden in Kruger and to answer all of our questions. We started the trip quite early and at 6AM we were at Kruger Park Numbi Gate, ready to begin our amazing experience. The tour has to start as early as possible in the morning, to catch all the animals in action. The ones hunting wake up when it’s still chilly outside, quickly grab their breakfast and then spend all day relaxing and saving as much energy as possible. We were very lucky to see a lions family just a few minutes after we started the tour. They were right next to us, mother, father and 3 lovely babies. The mother left quickly and hide in the high dense grass, after we stopped the car, but the others just stood there, for us to admire them. For us it was a scary moment, being so close to the lions, but Andy calmed us down and made us appreciate the moment even more, you don’t always get the chance to see free lions so close to you. The animals in the park are quite used to seeing cars and people, so they won’t try to attack you, if they see you, as long as you respect some common sense rules: you don’t get out of the car (not even open the window and get your hands our), you don’t make too much noise, you don’t try to interact with them, especially when they have fresh pray. We were also lucky enough to see all the big five of Africa : the lion, the leopard, the rhinoceros, the buffalo and the elephant. The members of the Big Five were chosen for the difficulty in hunting them and the degree of danger involved. The big five are among the most dangerous, yet most popular species for big-game hunters to hunt. For the leopard, we did struggle a bit to find him, and when we almost gave up, Andy received a message from other guides, and we hurried to see this beautiful animal, a bit far away, just as he was climbing down a tree, in search for food. We did see all sorts of antelopes, zebras, giraffes, birds of all kinds, hyenas, wild dogs, monkeys and others. And each time we saw a new one, we were as excited as little children are when they discover a brand new toy. We were truly amazed of this beautiful experience, we kept talking for days about all the animals we saw during the 12 hours tour. Kruger National Park is, no doubt, one of the most important attraction of South Africa and a must see for everyone who visits this beautiful country.